On Philadelphia Division, we take a diverging path from the Main Line and Low Grade as we leave the Lancaster area to explore the former Downingtown & Lancaster Railroad, an interesting branch line operation that may have been the result of early efforts to expand the PRR soon after its charter. Early History: Surviving segment of Thomson’s Poker Game? No sooner than the completion of the Pennsylvania Railroad’s Main Line from Harrisburg to Pittsburgh the fledging carrier looked to expand its empire by purchasing rights, property and franchises to gain entry to new markets and expand upon their existing system. Largely driven by third president, J. Edgar Thomson, one of the largest single objectives was to gain direct access to Philadelphia. This would require control of the Philadelphia & Columbia Railroad, an 82-mile rail route that connected Philadelphia to the canal system at the P&C’s western terminus Columbia, all of which was part of the state-owned Main Line of Public Works. Though poorly engineered and in deplorable condition due to the mounting debt of the entire operation, the route had potential if the right funding could be secured and a staff of knowledgeable railroad men could be utilized to plan and execute improvements. This however would not be the problem for Thomson; it was more so the state who demanded a hefty sum for the Main Line of Public Works in its entirety with the clause that all parts of the system be improved and remain operational. Thompson's response? Build another railroad and marginalize the state system. Thus attention was focused on the recently incorporated Lancaster, Lebanon & Pine Grove Railroad, a start up enterprise looking to establish a connection between the Norristown Railroad and the Harrisburg, Portsmouth, Mount Joy & Lancaster Railroad which would essentially make the need for the P&C irrelevant. Founded in 1852, Christian Spangler a prominent Philadelphia businessman was named commissioner of the new line. Spangler, also a PRR board member would soon be named president of the railroad in 1853. In the spring of the same year survey crews worked between Lebanon and Cornwall doing just enough work to look like the Lancaster & Pine Grove would come to fruition. In 1854, facing the reality of an investment that now accounted for almost all of the Commonwealth’s debt, fear of financial ruin motivated the state legislature to pass an act to sell the Main Line of Public Works in its entirety for the highest bidder above 10 Million dollars. The PRR wouldn’t budge; Thomson continued his bluff letting contracts to begin minimal construction with no intention of building an actual railroad but rather to force the hand of canal commissioners to sell on the PRR’s terms and price point. For the next three years Thomson continued to wage his bets, showing public support for the construction of the Lancaster & Pine Grove. In 1855 the state legislature authorized another sale complete with operational clauses for the State Works to be sold at a minimum bid of $7.5 million; still no takers. Finally in 1857 a third bill was authorized for sale at or above $7.5 million including all rolling stock and property. With no other offers the PRR took control of the Main Line of Public Works in its entirety on August 1st, 1857. Now that Thomson had the last piece of railroad to complete a wholly owned main line between Philadelphia and Pittsburgh the Lancaster & Pine Grove Railroad would be dropped. While the bidding war for the PRR to assumed control of P&C raged on, the East Brandywine Railroad had chartered in 1854, building an 18 mile line between the main line at Downingtown and Waynesburg (later Honebrook), Pennsylvania. Commencing operations in 1860 and reorganizing as the East Brandywine & Waynesburg Railroad Company the railroad extended another ten miles west to New Holland by 1876 operating in rich agricultural country. The line was operated by the PRR under leases until June of 1888, when the property was sold under foreclosure and the company reorganized as the Downingtown & Lancaster Railroad Company. The road would later be extended from New Holland to Conestoga Junction, a total of 9.8 miles, opening for traffic in September of 1890 with the PRR operating the entire line as agent. The Downingtown & Lancaster was never intended to operate as a primary route, with a ruling grade of 1.6% westward, but the rural line did service the agricultural region with connections to the main line at both ends. When comparing the proposed route of the Lancaster & Pine Grove on Herman Haupt’s 1855 map the uncanny similarity of the route with parts of the D&L makes one wonder if the alignment is surviving property that was pawn to Thompson’s high stakes poker game to gain control of the P&C. 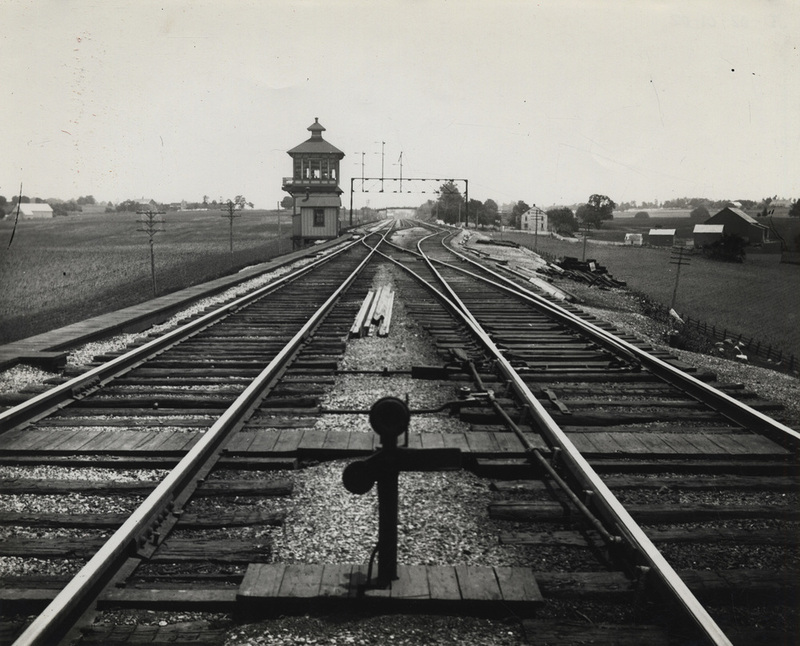 The Downingtown & Lancaster in the 20th Century: In 1903 the 37.5 mile line, property and franchises were officially purchased by the Pennsylvania Railroad and operation remained much the same as it had for some time. New Holland was one of the larger centers for traffic on the branch, originally home to New Holland Machine, Musselman Brother’s Feed and Lumber, EM Rutter & Co. among several others. One particular company stood out later becoming a major shipper on the branch; New Holland Machine. Founded in 1875 by Abraham Zimmerman a black smith and mechanical genius, Zimmerman began offering his services to area farmers in need of repair or fabrication of farming equipment. Zimmerman grew his business carefully watching the rising need for the internal combustion engines in the farming industry. Despite imperfect designs Zimmerman saw potential in these machines and sought to improve them by developing a new freeze proof water-cooled engine. By 1903 Zimmerman had incorporated the New Holland Machine Company hiring 40 employees to mass-produce the engines in a facility located on Franklin Street. Other items in Zimmerman’s product line included feed grinders, rock crushers and wood saws. By 1911 the company had grown to 150 employees and in 1927 the company employed 225. In 1947 the Sperry Corporation purchased New Holland Machine becoming Sperry-New Holland. Since the acquisition the company has changed hands several times and is now a brand of CNH Global which is majority owned by Fiat International. The New Holland, PA location remains the North American headquarters and is one of the largest plants for manufacturing hay tools in the world. The frame combination freight and passenger station at Leola provided very modest accommodations for passengers up until 1930 when service was discontinued. William L. Seigford hired with the PRR in December of 1959 and was later promoted and transferred from the West Coast territory of the PRR to the Harrisburg Division where he was assigned to the Lancaster Territory. Locally based in the Lancaster area, part of his territory included the New Holland Branch. Among other major shippers, Bill worked closely with Sperry – New Holland, who received both inbound steel from various mills and shipped finished product. At one particular time during the final years of the Penn Central era Sperry was experiencing a surge in production and the railroad had difficulty providing the necessary flat cars on a daily basis to move the finished product. Bill recalls, “Sperry’s traffic manager came up with the idea to charter a small plane to fly over the railroad in order to scout empty flat cars sitting in yards or sidings and insisted I go with them. We flew over Enola then on up the Middle Division to Lewistown where they (Sperry) loaded flatcars at the public delivery tracks with product from their Belleville Plant.” Through a stop off arrangement written in the PRR tariffs, these flat cars would be partially loaded in New Holland then shipped to either the Mountville plant or Lewistown to be completed depending on what dealers out west needed in their shipment. During the early Conrail era, Philadelphia’s marketing offices quickly realized they were loosing money on the additional stop off and sought to put an end to the unprofitable arrangement. Shipment of outbound loads tapered off ending in the early 1980's but the plant continued to received inbound steel for a few more years until Sperry had the necessary trucking companies to haul both. The D&L faced several abandonments with the first major change in the 1950’s when 8 miles were abandoned severing the line’s end points. By the 1960’s the entire east end from Downingtown was gone and Honeybrook (formerly Waynesburg) was the far end of the branch from Lancaster. Conrail continued to cut the line back eventually making East Earl the end of the line. Today trackage ends on the far-east end of New Holland near New Holland Cement. The remainder of the extant line in service connects with the former PRR Main Line in Lancaster at Conestoga interlocking continuing 12.8 miles to the end of track. Though Sperry-New Holland doesn’t ship by rail the branch remains very profitable, being served today Monday through Friday by Norfolk Southern's locals H28 and H29 (afternoon relief crew) and is home to major shippers like Dart Container, L&S Sweeteners, RR Donnelley Printing and several others. I would like to acknowledge both William L. Seigford and Mark Hoffman for taking the time to show me around the branch and share a wealth of information on the operations and local history of the New Holland branch through its later PRR, PC and Conrail operations.